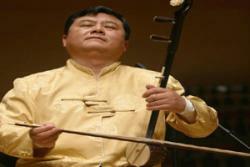 Come and enjoy one afternoon or evening music of Erhu with CCC. Erhu, one of the most Chinese two-stringed fiddle instrument imported from central Asia, has been a must for Chinese musical orchestra. During this special event you will have the opporuntity to experience in very close distance performance by the famous erhu artist Li Fuhua, and listen to a few of his adorable young students performing and singing. He will also give a small talk about the erhu as an instrument, it's important to China's cultural heritage and how to play this amazing instrument. Audiance will have chance to learn to play erhu in the middle of the event. Li Fuhua is a prestigious erhu performer, who has been following Chinese presidents to perform in Vienna Golden Hall and other famous concert halls in the world. Li is also a compassionate and talented teacher with a dedicated following of students, both children and adults.